It is a poem to express the bad effects of tobacco. It was written aiming the World No Tobacco Day. Made a rapid spread of Nicotina Tobacum. On third of adults get addicted! Smoking cigarettes became a trend. Under aged exposed and addicted to smoking. No warnings or bad effects given. Suffer from heart problem, cancer, lung diseases. 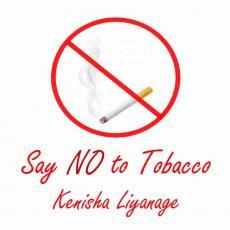 It’s time to say NO to Tobacco. © Copyright 2019 Kenisha Liyanage. All rights reserved. Good thing if you dad doesn't smoke any more. You have projected the social evil with strength. good message who smokes. good work. Yah, I know that it's one of the major problems throughout the world. Thankx for reading and commenting! This page was created in 1.1515 seconds.